solutions for your hardware, software, networks, printers, phone systems, and more. We’re experienced with handling custom IT solutions in a variety of industries. Once again, your company scored an A plus with me. I called two hours ago about a virus invasion that windows defender could not remove. You solved the phone call by a recommendation,….and I will be buying the program. I will recommend you because you are a “can do” operation. Thanks. What makes Fusion IT so dedicated to your success? Listen as CEO Michael Waldschlager and Founder Kyle Wentworth talk about service leadership, business integrity, and what West Michigan companies need to know about technology and cybersecurity today. Listen to "CEO Spotlight: Michael Waldschlager & Kyle Wentworth from Fusion IT" on Spreaker. 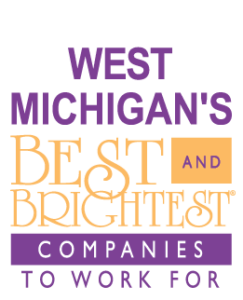 Thanks to our talented team, Fusion IT is honored to be chosen as one of West Michigan’s 101 Best & Brightest Companies to Work For! 1 in 3 Employees Will Open a Phishing Email. In the last year alone, 90 percent of data breaches started with a phishing email. Complete our no-obligation 15-day phishing simulation, talk with us about your results and we’ll enter you in our drawing to win an iPad or 2 in 1 notebook.